Challenge #19 "Another small bug" was a stack-based buffer overflow. Djo (@shell_storm) has already published a write-up (english) on Nibbles' blog, as well as @hellman on Leet More's blog, and Agix (@Agixid) on shell-storm. Just like hashcalc1 or hashcalc2, there was no NX. 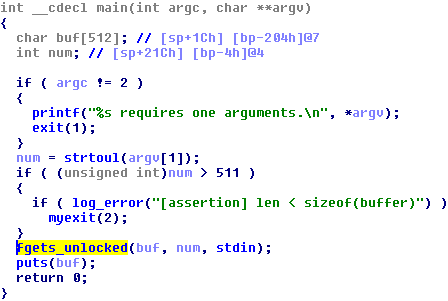 However, ASLR was enabled. Djo and hellman both used a big nopsled + brute-force to circumvent ASLR, Agix used a nice ret2ret, while I chose ROP to mmap rwx. Good thing is that it would also have worked if NX had been effectively enabled. Not familiar with ROP? Have a look at the references posted on this exploit writing tutorial by @corelanc0d3r. This time, let's attack /opt/pctf/z2/exploitme. But there was a check? Well, you may argue it should not work because there is a check on size >= 512. However, if you read attentively, it only exits if log_error succeeds. Not sure if it was intended :) but it explains why the previous check on user-supplied size parameter does not stop the program. It means that libc functions are present in the binary, like... mmap! How good is that? Well, we can simply return to mmap asking for an rwx area, copy a shellcode in it, and return to it! Straightforward ROP, similar to my Shmoocon's CTF warm-up alternative solution (exploit). I used a bunch of gadgets to copy the shellcode byte per byte with a wrapper since we were not limited in payload size. 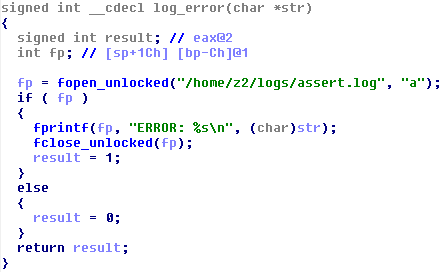 One could use alternatively use recv to directly receive a shellcode from stdin or else.